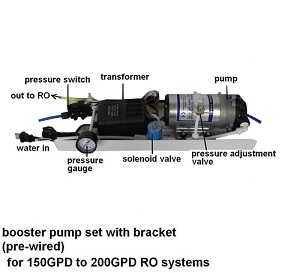 This water booster pump is designed to be used for 150GPD to 200GPD Reverse Osmosis water systems. 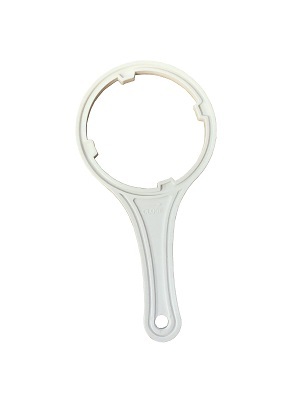 It is pre-wired and pre-installed on a steel bracket so that the installation would be easy and neat. It also includes a pressure adjusting valve which you can adjust the boost pressure. Transformer: plug in to regular 110V electrical outlet. 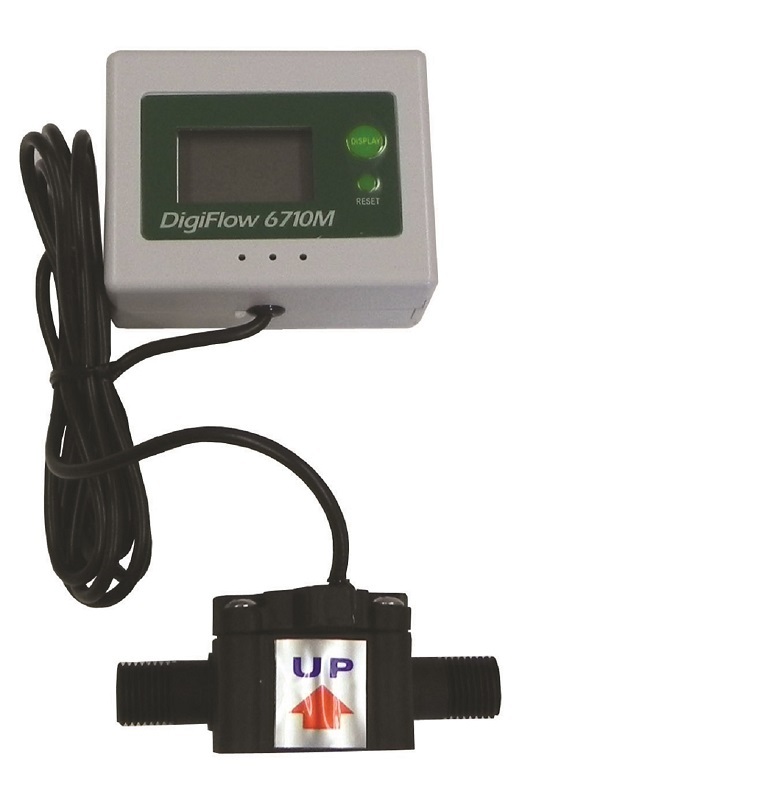 Pressure Switch: to make the pump and RO system function automatically. It turns on/off the pump and solenoid valve when RO pure water output is closed or when the pressure tank is full (pressure setting 40-55psi adjustable). Pressure Adjusting Valve: to make adjustment on the boost pressure of the pump. You can use the pressure adjusting valve to fine tune the desired operating pressure. For example, you have a 150GPD RO system and the water supply is 40 psi and drain rate is 850 mL/min. After the pump, the boost pressure could be 80 psi. So if you want to decrease the operating pressure to 70 psi, then you can turn the pressure adjusting valve slightly open (turn counter clockwise) If you want to further decrease the pressure, then you can turn the adjusting valve counter-clockwise. So you can adjust the pressure between 40 to 80 psi. The boost pressure could be 90, 100+ psi depends on the flow rate of the pure water and drain water. The boost pressure could be only to 60 psi when it's approaching the pump's upper limit. Such as 200GPD RO system or if the drain rate is over 1000 mL/min. NOTE: If you want to increase the boost pressure higher than the max. pressure, you can make changes to the drain rate. But contact us for advise first. NOTE: This pump assembly is not a continuous duty. If you need to run the pump more than 4 hours, you can use a timer to turn on one hour and turn off for 1/2 hour to cool down the pump and solenoid valve, or you can put a fan to blow air into the pump assembly to cool down the pump.